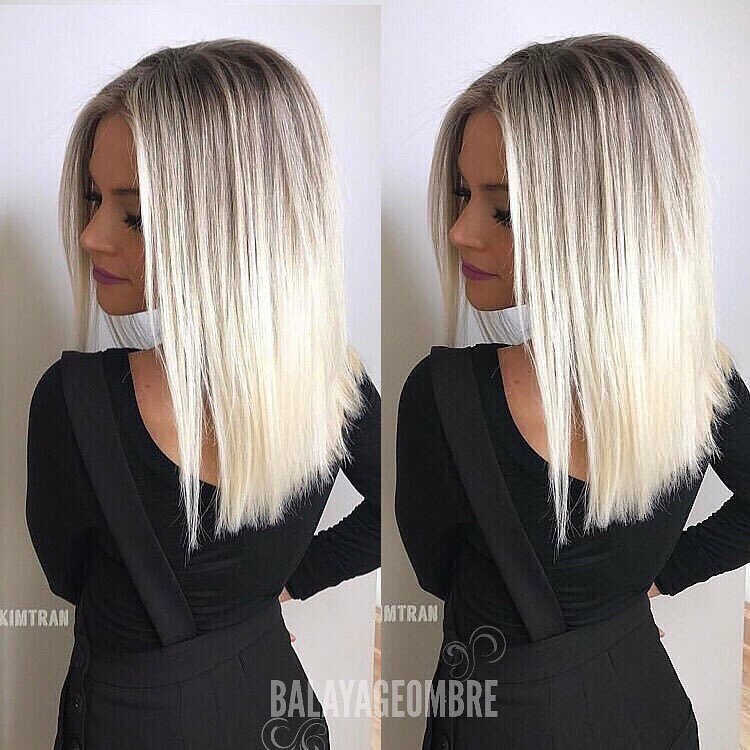 Although long hairstyles with straight hair are not the biggest hair trend right now, there will always be a demand for long, straight, blonde hairstyles somewhere in the world! This year’s blonde shades are more subtle and tasteful than ever before, so muted, faded and soft beige shades are big news! 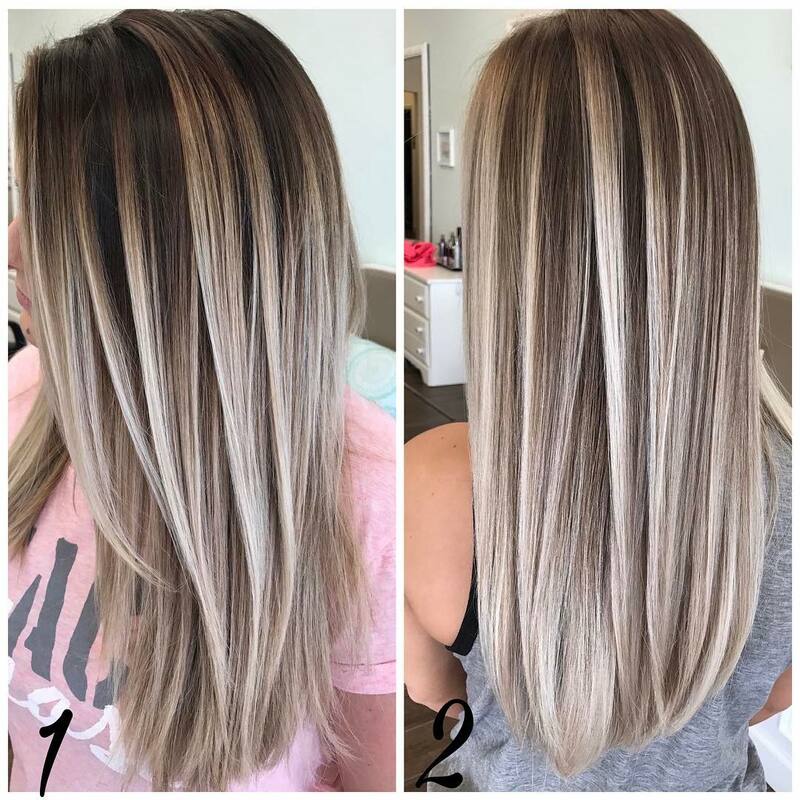 So if you’re ready to ditch an over-processed dye-job, add interest to your natural color or switch to a more sophisticated look – you’ll find it here! Striped dual-blonde highlights are still a popular way to add texture to long, straight hairstyles. Brown roots above have been highlighted with ash, beige and white, creating a trendy, 3-D effect. This style is suitable for thick hair, cut in long ‘sliced’ layers that just reduce the thickness in tapered layers at the tips. This creates a natural curve in thick hair to avoid the bulk it can have at the ends. Shorter layers around the face soften the line. Here’s our old friend, the long bob or LOB, with a fabulous new look! From warm, medium-brown roots, this long hairstyle gradually becomes a warm shade of mink down to the tapered tips. As you can see, mink is a gorgeously balanced blend of pink, gray, brown and beige. It gives long hairstyles a fresh, color option that’s the perfect compromise between brown and blonde! 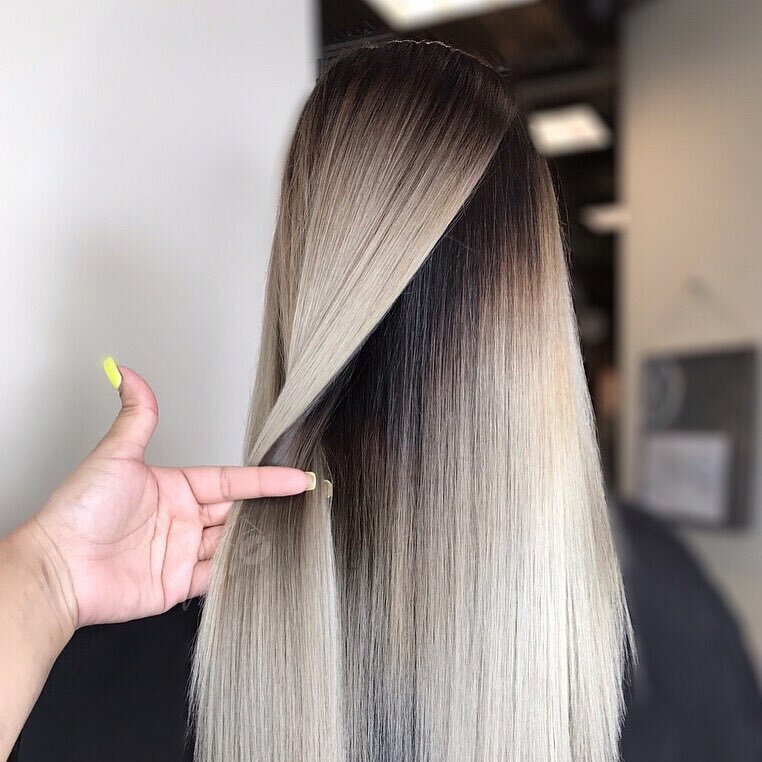 The colorist has also placed fine threads of pale blonde from roots to the tips, uniting two beautifully blended sections. This lovely hairstyle for long, straight hair is also highlighted in stripes, but the shades are very closely matched. This creates a more natural finish. There are definite hints of pink adding warmth to the oat, white and beige blonde shades in this hairstyle. It’s tricky getting the correct balance between ash-blonde and beige shades, so you need a well-trained colorist to match your skin tone. Extra long straight hairstyles benefit from features that give it more personality. For example, the stylist has cut this model’s thick hair into long layers with attractive, feathery tips. This creates a light, feminine finish to the style. 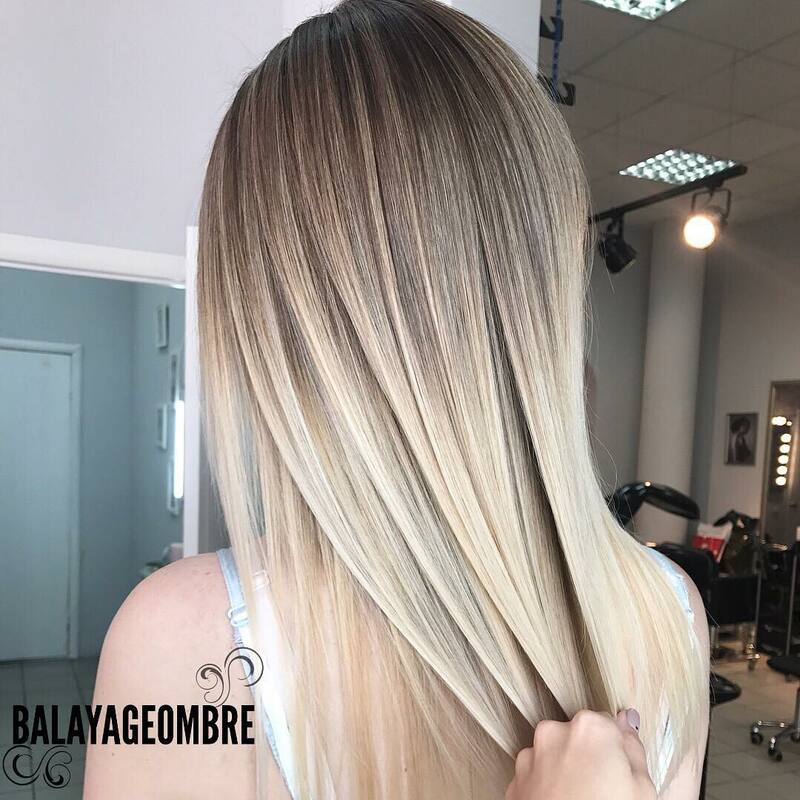 This added texture is accentuated by the beautifully blended, pale-golden-beige ombré, with beige-brown balayage low-lights. 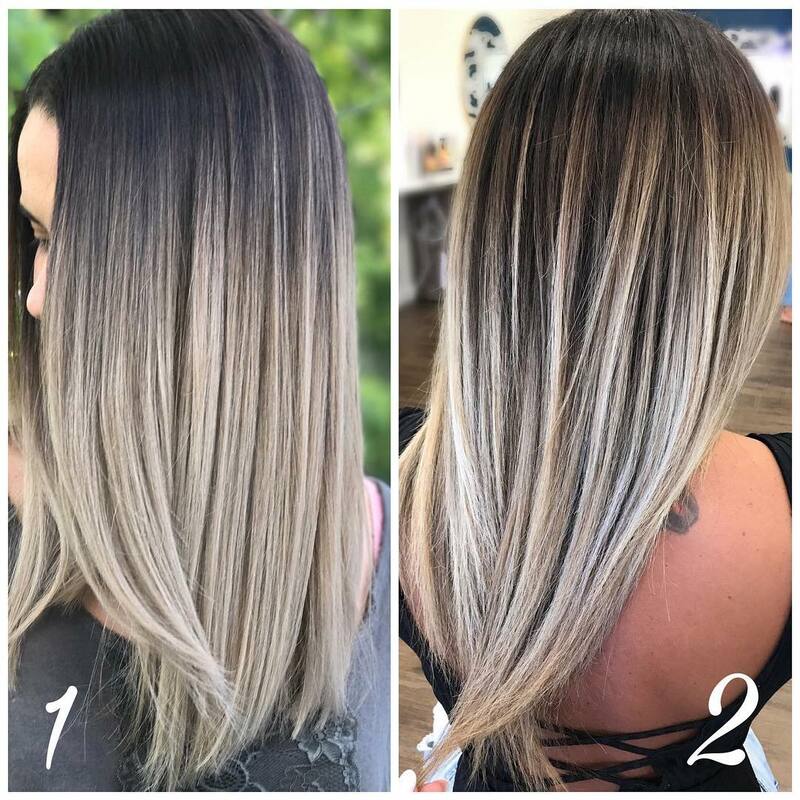 This is an expertly applied hair color design in three main sections, which are so well-blended they give a very natural look! Now that we have so many new variations in the shades of blonde on offer, I have to be careful to identify the differences between gold, beige and ash! This gorgeous hairstyle has ultra-modern beige roots which glide effortlessly into a glamorous pale-gold-blonde ombré. Pale golden shades complement skin with a warm undertone, so do talk to a good colorist before you decide on the best ombré shade for you. This one-length haircut with texture at the tips suits fine hair types. Although the variety of upstyles and braided hair designs you can wear with long hair is enormous, it has to be said that the options for long, straight haircut makeovers is limited. However, I think you’ll agree that the stylist who did this makeover created a completely new look! The soft curves in the tips from Image 1 have been replaced by fantastic multi-layered, choppy tips giving Image 2 a fab, contemporary look! 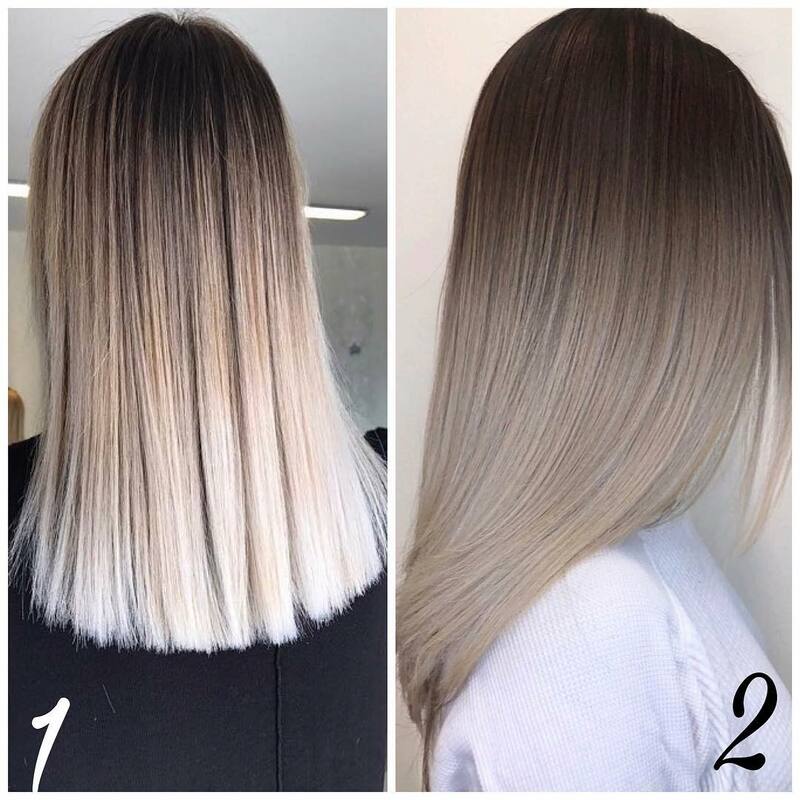 This is another interesting makeover, showing the different overall image you get on the same haircut, but in different colors. Both images show a same-length haircut, smoothly styled with clever texturing decorating the tips. 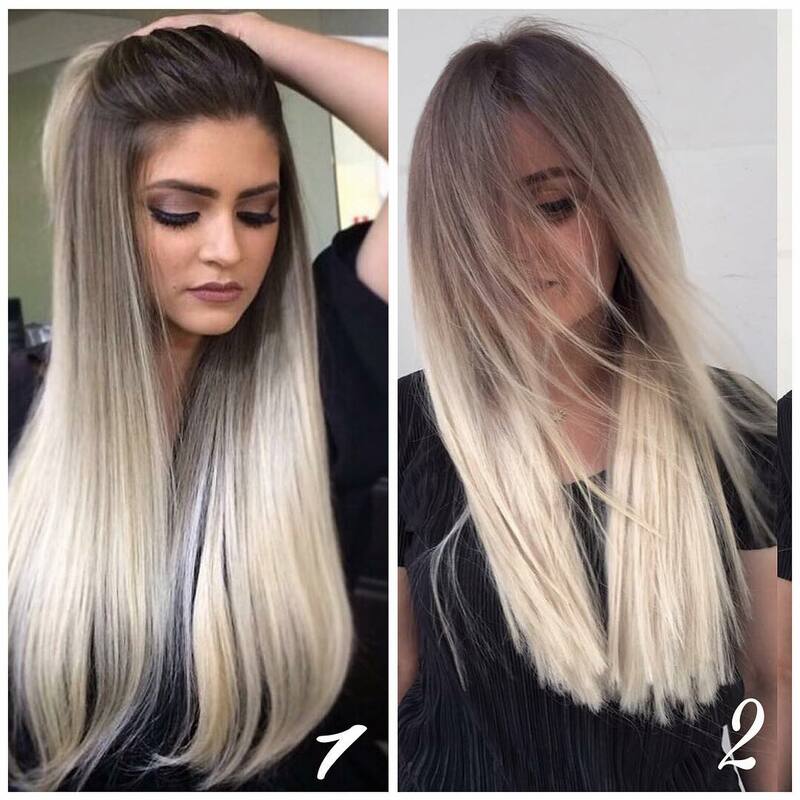 And both pics show an ombré technique applied to hair with medium-beige roots. 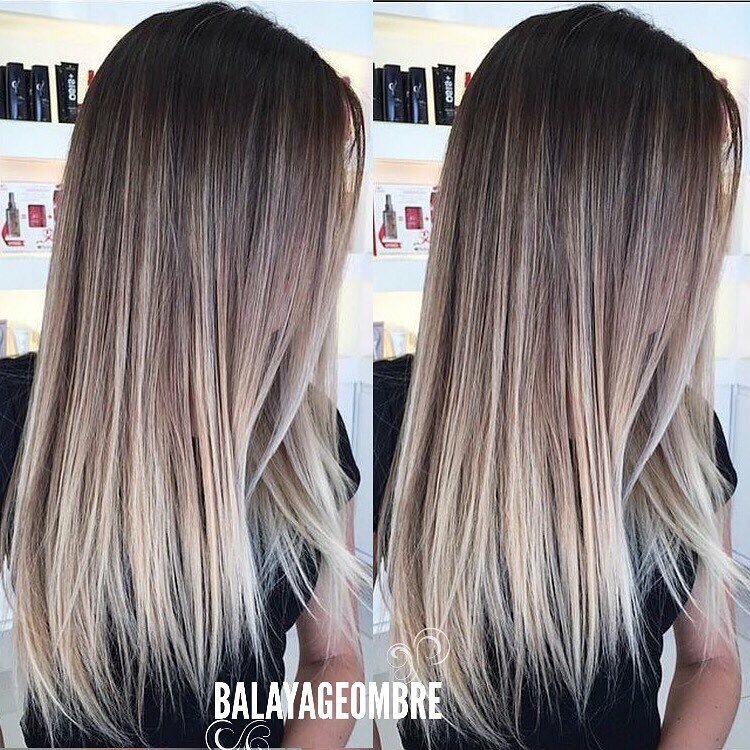 However, the bright, white-blonde ombré in 1) leaps out at you, whereas the very subtle beige ombré in 2) is harder to see. Image 2 appears to be an all-over color, but it’s really a beautifully matched blend of beige and light gray shades! I call it ‘grayge’ and it’s all the rage this year! These two images show hair that has been updated in subtle ways to create more texture and movement. First of all, the straight line around the bottom has been trimmed into a tapered, V-shaped line, with heavily textured tips. This is a great way to create more shape and movement in long hair. Shorter layers around the face are flattering because they reveal more of your face than long ‘curtains’ that hide your whole profile. 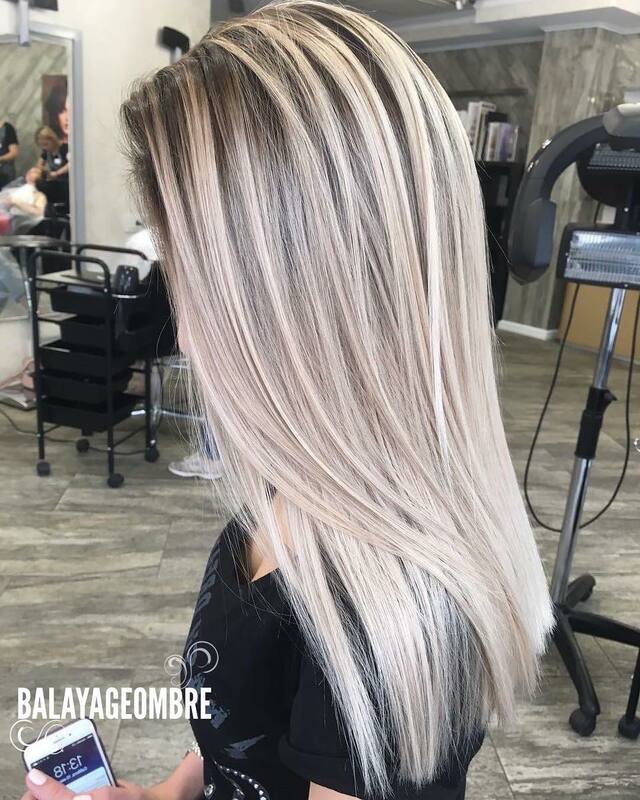 And the second makeover feature is the addition of white-blonde balayage highlights, that create 3-D depth and lots more texture! I love the trend towards lighter root colors! And this is a wonderful example of the different color tones needed to create a soft and subtle ombré. 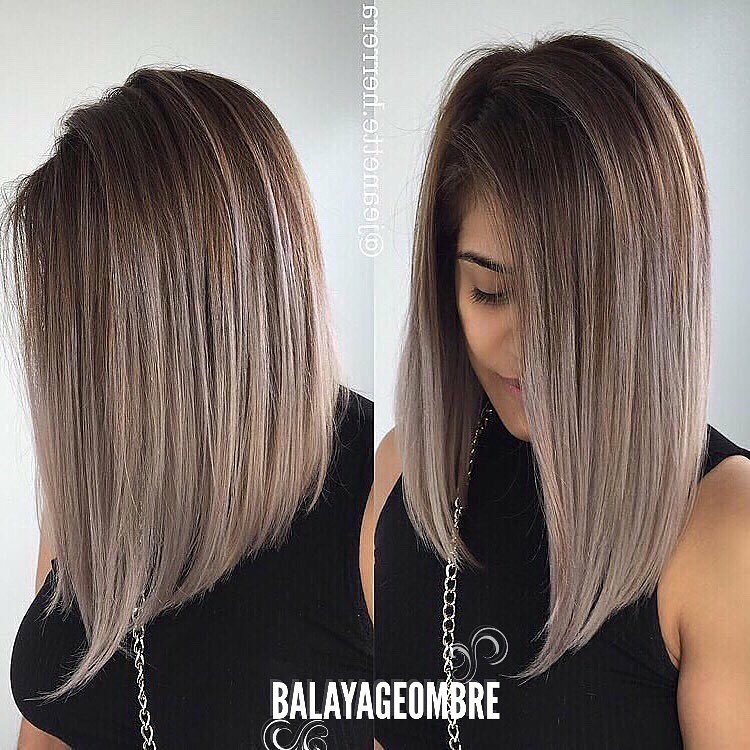 This is quite a ‘natural’ looking ombré, but the light-brown roots have a hint of gold at the side and gray at the back. Above left of the strands in the stylist’s hand, I can see a touch of green toner and underneath, the hair’s an adorable peach-blonde! Clever stuff, hair coloring! Sometimes you look at the work of a talented colorist/stylist and think they could easily become a famous artist! The color-control in this beige and ash-blonde haircut is a real masterpiece of creativity. There’s light-copper on the right side, fading down the brown V-shape, which moves through ash-beige to ecru. The hair has been cut in a steep V at the back, so shape and color complement each other perfectly!